Dr. Zack Walker has always wanted to pursue a career that allows him to impact people’s lives directly. 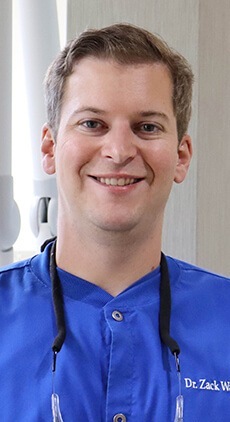 Whether he’s helping others remove pain due to a damaged tooth or restoring damaged teeth, Dr. Zack is incredibly satisfied by improving people’s smiles and oral health. We hope you take a moment to get to know him a bit better before your next visit! As the son of two skilled dentists, Drs. George and Veronica Walker, Dr. Zack has dental care in his blood. Working with his parents and seeing the effect of their work in the community inspired Dr. Zack to follow in their footsteps. He’s very excited to finally be apart of the team after completing his education and residency. Dr. Zack began his education at Wake Forest University where he studied biology and chemistry. He earned his doctorate of dental surgery from the University of North Carolina School of Dentistry and graduated with honors in 2017. He then completed the Advanced Education in General Dentistry (AEGD) program in Elizabeth City through the East Carolina University School of Dental Medicine. Dr. Zack loves working with patients of all ages to achieve their smile goals. He is dedicated to continuing education courses so he can offer a wide range of dentistry services, including advanced oral surgery and endodontic (root canal) treatments. He especially enjoys advanced restorative and cosmetic cases where he gets to partner with patients to create a beautiful smile they feel proud to share. Dr. Zack maintains professional membership in the American Dental Association and the Academy of General Dentistry. When he’s not hard at work helping patients, Dr. Zack enjoys spending time outdoors, hiking, fishing, golfing, and visiting the beaches of North Carolina. He also enjoys cooking and spending time with his long-term girlfriend, Kim. One interesting fact about Dr. Zack is during his undergraduate education at Wake Forest, he studied echolocation in bats, which is the use of biological sonar by animals to understand their surroundings.